Wellington is not a big city. It is possible to do pretty much all - or at least most - of the usual tourist attractions in one day and on foot. We know this to be the case because that's precisely what we did today. Our plan for the day was quite simple: go to the Te Papa Museum and try out the cable car that will take us up the hill for views over Wellington Harbour; anything else that we manage to do is a bonus. The Lonely Planet - our travel guide of choice for most places - does not appear to offer much more in the way of attractions for the tourist. Even the skyline has difficulty expressing that it is the capital city of New Zealand - in any other country it could be just another city by the sea. Auckland certainly looks and feels more like a capital city than Wellington. 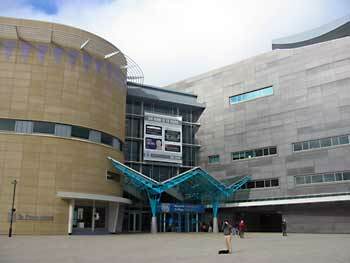 Entrance to Te Papa museum. Te Papa is, without doubt, one of the best museums I've been to. While a lot of the exhibits are kept behind glass, there are many more that are very interactive, none more so than those in the 'Awesome Forces' section. Here you can learn all about the earth's tectonic planets and discover why New Zealand has such a wild geography (because it's riding on the edge of the Australian and Pacific plates). There's also a room where you can experience what it's like to be in an earthquake, having first seen video clips of a major earthquake that affected the New Zealand town of Edgecombe (in the 80s I believe). The floor shakes while the television in front shows shelves spilling their contents all over the floor and the speakers belt out crashing and smashing sounds. While we were at the museum, there was a memorial service being held for Michael King, a very prominent Kiwi historian who died in a car accident recently. It was a tragic story - after writing a biography, the subject of the biography died of cancer. King was then diagnosed himself and he was fighting the illness. Just as it seemed he was beating it with chemotherapy and going into remission, he and his wife were killed in a head-on collision. Attending the public memorial was the New Zealand prime minister and a host of other prominent figures. It seemed appropriate that this would be the location - the nation's favourite museum, a place of learning for so many people - for one of the country's greatest writers and historians. 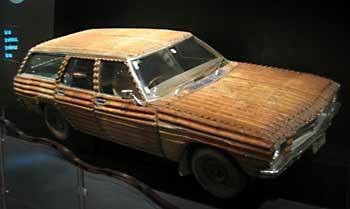 Corrugated iron-clad car in the Made in New Zealand section. While walking around the 'Made in New Zeland' section I spotted Abbey, who had kindly given me a lift from the camper van depot back into Wellington yesterday. Strangely, I recognised her straight away - strange because, sitting in the back of the car yesterday I saw little more than the back of her head and her eyes in the rear view mirror! We talked for a while, finding out more about her and Ben's travel plans, before parting once more, saying that we "might bump into each other again". Who knows, it might happen! We walked around the majority of the museum, even the art gallery section on the 5th floor (I did my best to stoop forwards and take in the fine details of the art, rubbing my currently hairless chin in an attempt to look cogitative and intelligent). When we came in to Te Papa we bought one of the guide leaflets that suggests a path through, offering information about each part of the museum along the way, but even without one of these guides you can enjoy the museum (no questionable, 20-year-old labels on these exhibits like you get in the Egyptian Museum in Cairo!). At the end, we handed it back for someone else to buy - a small contribution, then, of $2 to the museum, itself a ridiculously small amount to pay for two people. The cable car runs from a position just behind Lambton Quay, which itself is a continuation of Willis Street, one of Wellington's main shopping streets. 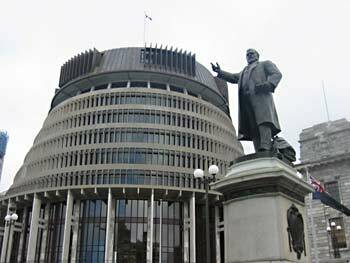 But before we tried this out, we continued right to the end of Lambton Quay to see 'the Beehive' an office building that is linked to the Parliamentary building. It's not the prettiest building in the world, but it is distinctive, for sure, and for better or worse is one of New Zealand's (man-made) icons. Walking up to the Beehive, it amazed me to think that this was the capital city. It was 3pm, we were on a major shopping street in the heart of the city, and yet the roads were almost empty, and as we got nearer to the Beehive, more and more shops were shut. It was like a public holiday or something. Very surreal. Even in the sleepier cities in the UK, you'd expect traffic to be bumper-to-bumper and the pavements to be clogged up with shoppers. Not so in Wellington. Having taken the obligatory photos of the Beehive, we walked back to the cable car office and got our tickets for the brief journey up the steep hill to Kelburn. The view over the city and harbour was pretty good, but it could have been better had the weather not been so dull and grey. It seems that Wellingtonians are all feeling a little agrieved by the weather - there was very little summer to speak of, and grey skies and blustery winds seem to be the order of the day/month/year. At least it wasn't raining today! 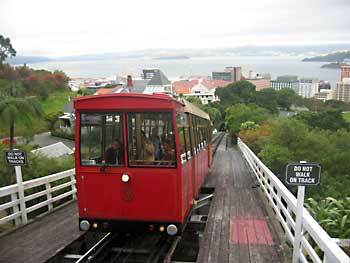 Also at the top of the hill, near the cable car station, are the Botanical Gardens. We didn't take a look around simply because the light was fading and with it whatever modicum of warmth the day offered. We decided to leave that for another time, maybe, and headed back down to the streets below for something to eat before calling it a day. We'd done a fair amount of walking already, and our hostel was some distance away still, up a hill - refueling was needed first. 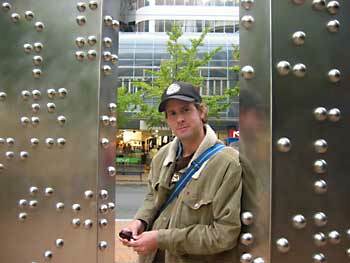 Ian standing by an interesting sculpture called 'Invisible City'. Would that be giant Braille? And if so, what does it all mean? And just how big are blind people's hands in Wellington if this is Braille?